In our home we love to ride bikes. I believe our daughter is the biggest fan. 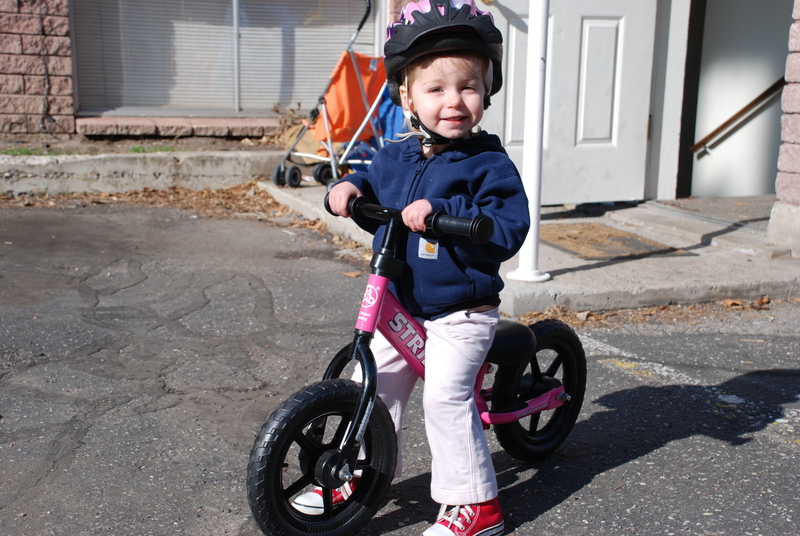 When we gave her her first bike it was a most exciting moment for our family. We did a lot of research and found out about balance bikes. Instead of having a chain and pedals balance bikes are just a frame with wheels. They encourage kids to use balance and dexterity when controlling a bike. They are usually lighter than regular bikes so kids have an easier time keeping the bike upright. They are also said to help children learn to ride a pedal bike with very minimal time spent learning with training wheels. Our little bird on her Strider. There are many push bikes on the market and with a little research you can find one that fits you and your child perfectly. I collected some of the more common ones for you to take a gander at. Strider Has a metal frame and handy little foot rests for your child to use once they have mastered balancing. Skuut Wooden bikes with inflatable tires and adjustable seat. Likeabike Similar to the Skuut but with many different styles for the many different riders out there. Glide This is also a metal frame bike and comes with cool little footpegs for the kids to rest their feet on. Specialized and Raleigh both make balance bikes as well. Balance bikes are a really great way to start your child on a bicycle. It’s been really exciting to see how much our daughter has advanced in the last few months. She is fast and has even started doing ‘tricks’ like bunny hops. She has confidence on her bicycle and already knows many of the rules of the road. We are very pleased with our purchase and have seen many benefits from it already. If you are in the market for a bike for your child take some time to research balance bikes and see the benefit they can have for your child. MadDog Cycles carries the Strider and the Scuut brand while Bingham Cycles carries the Specialized one (I am not sure if Bingham has them in stock but they do carry Specialized Bicycles). Have a safe ride. This entry was posted in Kids and Family Cycling by Staff. Bookmark the permalink. Balance bikes are a great way to learn to ride and it sounds like he is well on his way to being a great rider.thanks for show wonderful balance bike.i would purchase for my kids.